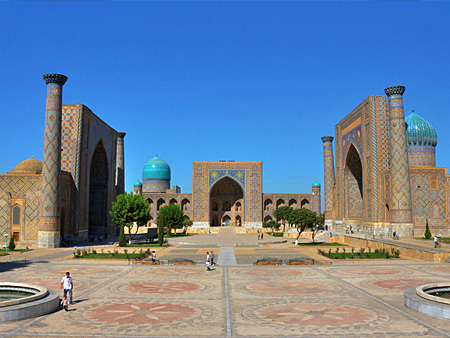 The Registan ceremonial plaza, the center of the medieval Samarkand, is the outstanding example of town-planning skills of the Central Asian architects of the 15-17centuries. It is surrounded on three sides with the magnificent buildings of Ulugbek, Sher-Dor and the Tilla-Kari madrassahs. 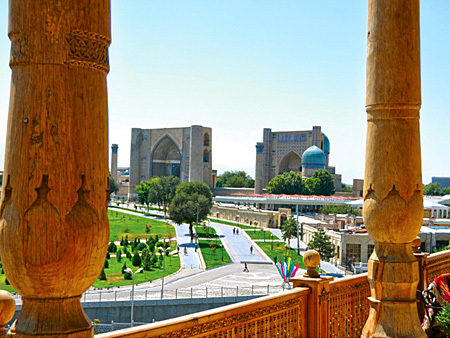 The Registan ensemble is where all the radial streets meet and it is here that ruler’s decrees were proclaimed, where justice was done and trading was in full swing. The the South of the plaza is the Gur-Emir Mausoleum (XIV-XV), built as a burial place for the members of the Timur’s Dynasty. Here were Timur, the ruler of Samarkand, and his grandson Ulugbek, an outstanding scientist and astronomer, buried. Ruins of Ulugbek’s observatory, with parts of the giant sextant, used to observe the stars, were discovered outside of Samarkand at the beginning of the 20th century. It was during Timur’s rule that Samarkand achieved an unprecedented growth. Smarkand is also well known for its brilliant great scientists, writers and painters like Rudaki, Babur, Jami, Avicenna, Navoi, and Ulugbek. Outside of Samarkand is located the ancient settlement Afrosiab. As archeological discoveries prove, Afrosiab was populated in VI-XII centuries A.D. Numerous objects, found during excavations – pottery and terracotta statuettes – can be seen in the Aforisiab Museum, located on the ground of the settlement. Samarkand is a city full of legends. Even the streets, ravines and water reservoirs have their own tale. The Shakhi-Zinda, architectural ensemble of the XI-XIV, is considered to be a Holy place. According to legend it was the largest religious and cultural center in the Central Asia and pilgrimage to this place was one of the pilgrimage places for the Muslims around the world. The name, which means Tomb of the Living King, refers to its original innermost and holiest shrine: a complex of cool, quite rooms around what is probably the grave of a cousin of the Prophet Muhamad-Qasim Ibn Abbas. In the foothills overlooking Afrosiab to the northeast are the remains of the remarkable observatory of Timur’s grandson Ulugbek. The building was destroyed by fanatics in 1449 and visitors can view the underground section of a vast largest 90 degree quadrant the world had never seen. The sextant is now covered by a portal and vault at the center of the observatory’s foundation. 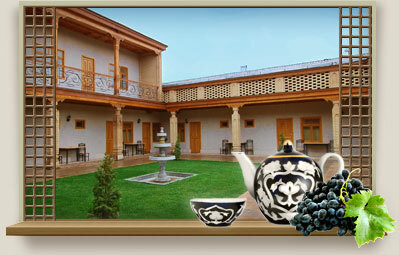 In addition to the cultural sightseeing there are many sites for rest and recreation in Samarkand. The Zarafshan Nature Preserve was established on the flood lands of the Zarafshan River with thickets of sea-buckthorn providing refuge for hares and rare Zaravshan peasants.